Unique Design for all high-end appliances: This is the first converter to be able handle a high-end hair dryer, blow dryer, hair curler and hair straightening iron. 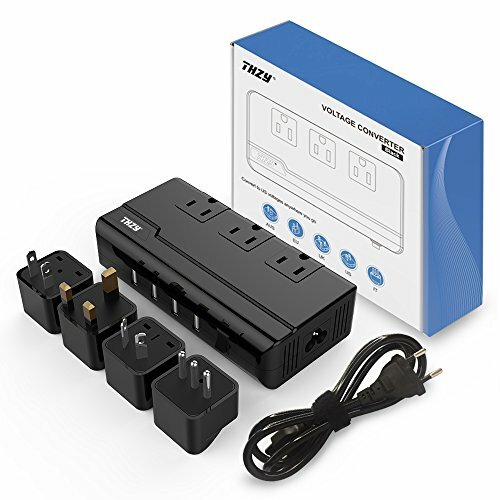 With its worldwide adapter set, it can handle almost any electronic devices, and it will convert voltage for most electronics around the world. Safety & ProtectionsBuilt in multiple protections are over-current, over temperature, short-circuit and overload. 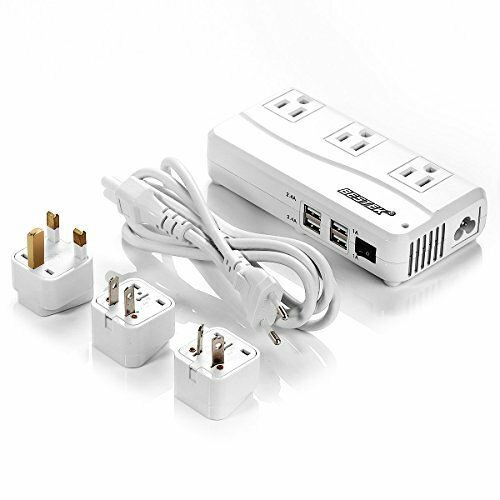 [*Note: USB outputs are completely isolated from the AC power to keep your devices safely] Five adapters are included Type A mainly used in the USA, Canada, Mexico & Japan Type D mainly used in India, Dominica, Ghana, Iraq, Lebanon, Pakistan, Tanzania, Zimbabwe Type G mainly used in the United Kingdom, Ireland, Malta, Malaysia & Singapore Type I mainly used in Australia, New Zealand, China & Argentina Type L mainly used in Italy, Chile, Cuba, Eritrea, Libya, San Marino, Syria, Uruguay & Vatican City Travel pouch Makes it easy to take the kit with you on the go. 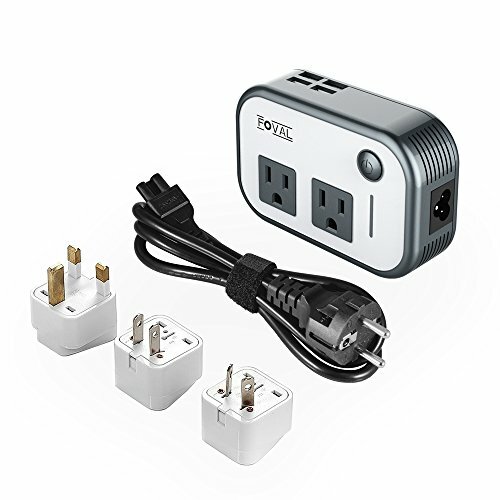 Travel on the go When traveling between regions with different voltage, you will need a plug adapter and a voltage converter in order to safely use your valued devices when you go abroad. 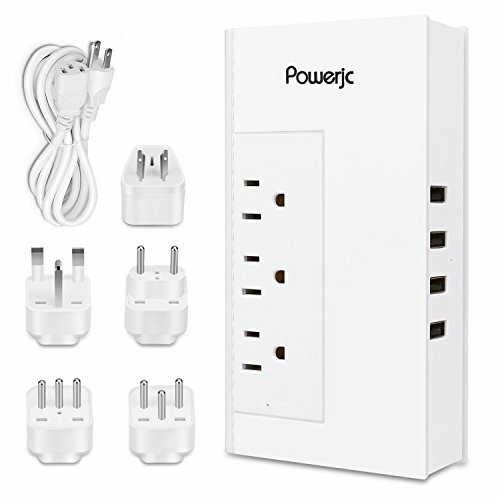 DESIGN PROPOSAL:1) Set 3 kinds of safety protection, overload protection, over-temperature protection, overvoltage protection.VOLTAGE CONVERTER: Powerjc voltage converter can convert the input voltage (100-260V AC 40-60Hz) to the output voltage (100V-130V AC).SPECIFICATIONS:• Rated Power: 1875W, 2000W Max• Frequency: 40-60Hz• Input: AC 15A 100-260V• Outlet Output Voltage: AC 100V-130V• Outlet Rated Output Current: AC 12A, 15A Max• USB Output: 5V/2.4A*4, Max 6A in total• Dimension: 16.1 x 8.5 x 3.4cm• Product Weight: 1.45lb• Detachable Power Cord Length: 59in• 5 Additional Replaceable Plugs: EU/UK/AU/Italy/IsraelWHAT YOU GET:• 1 x Powerjc Power Voltage Converter• 1 x Detachable Cable• 1 x Travel Pouch• 5 x Interchangeable Worldwide Travel Adapter((UK/AU/Italy/EU/Israel)• 1 x User ManualSAFETY WARNING:1) Please don't supply power for the load electronic products over 1875 watts.2) This product is a step down converter 220v to 110v. 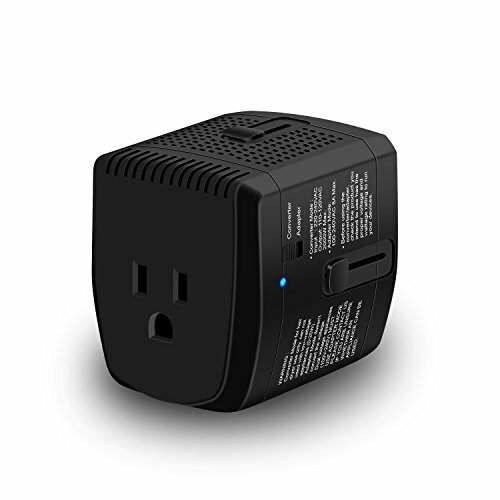 If need to test the AC output voltage with a voltmeter, you must plug in minimum 20W load to test out the exact voltage.3) Before using the converter, check the appliance you intend to use to ensure it has the proper AC voltage and wattage. Remember to select the proper mode for your appliance. 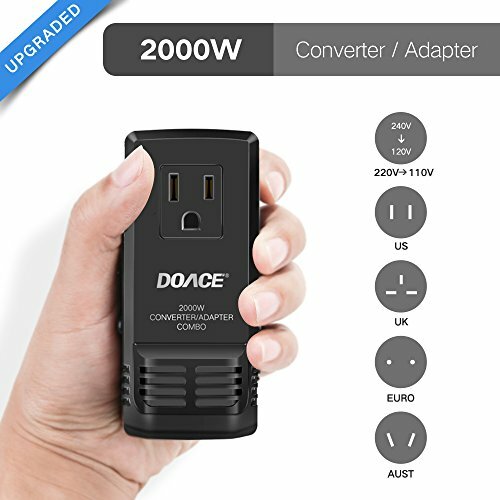 100 Watt Dual Voltage Converter For Worldwide Use. 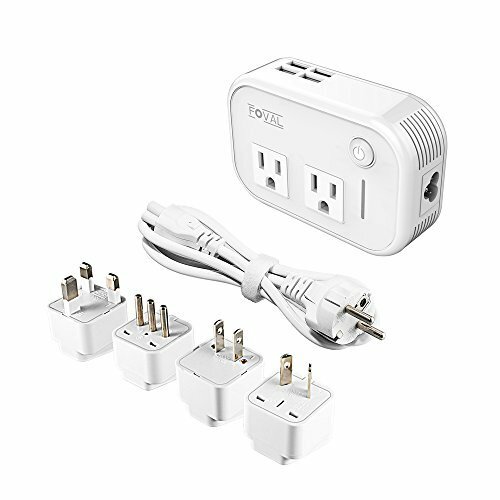 Universal Outlet Accepts Plugs From Any Country(accept S.Africa). 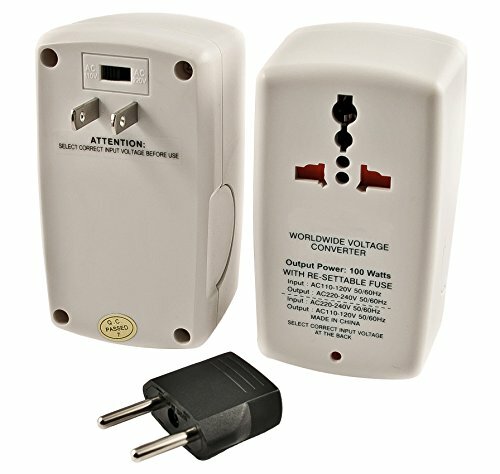 Use In USA or Any Other Country Worldwide - compatible with 110V/220V/240V. Re-settable Fuse, Led Indicator. 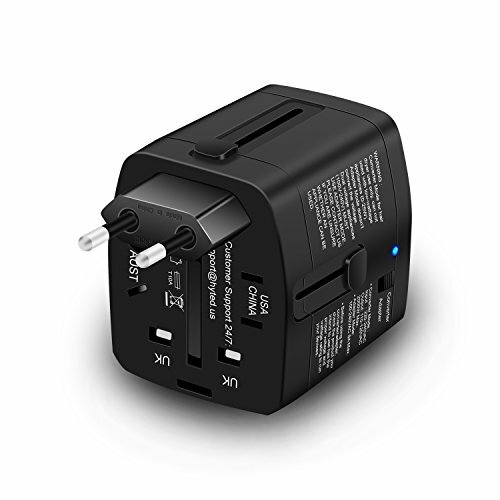 Adapter for Europe Included - (Adapter for UK/Ireland to be bought separately). Ideal For Use with Light Portable Equipment Like iPods, Phones, Cameras, CD Players etc. 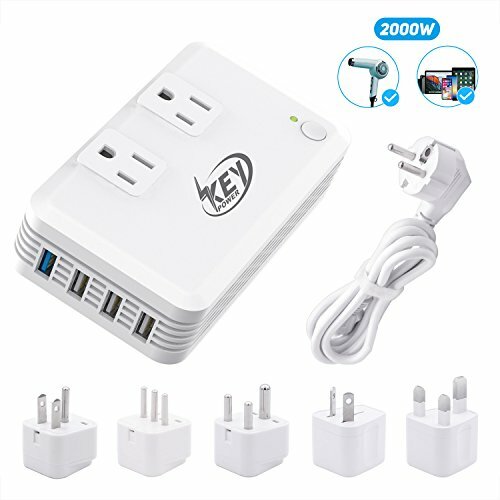 Do Not Use with Laptops, Tools, Hair Dryers or other Heat Producing appliances.